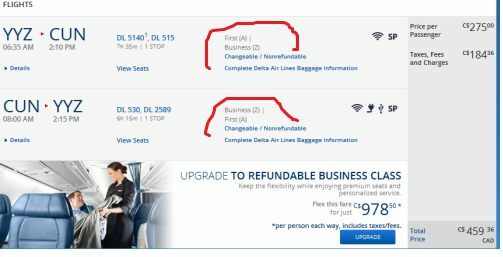 Delta's website is currently showing Toronto - Cancun, Mexico (CUN) flights in business class for $459 CAD roundtrip including taxes. Note: If you see the price change from $459 to $1050 that date combination may have sold out. Try slightly different dates. Dates around Christmas will obviously be selling out *fast*. toronto, yyz, flight deals, cancun, mexico, cun, delta, north america and business class. 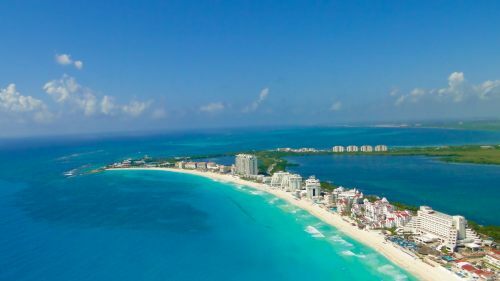 7 Responses to "Toronto to Cancun, Mexico in Business Class for $459 CAD roundtrip including taxes"
How do you "click through" to the Delta site? You just need to pick your dates on Google Flights, and then click on the Delta flights. Eventually you'll get to a screen with a 'Book with Delta' button. Click on that. I think these are gone now! Deal seems to be gone! I managed to book flights for a wedding I have to attend next April ... $918 for two of us round trip First/Business! Same flights now show over $3,300! Thanks Chris_Myden! Yep, they're all back to normal prices now. Congrats to those who booked it! Thanks, Chris, I was able to purchase for Dec 24 to Jan 6, YYZ-DET-CUN, CUN-ATL-YYZ, At first attempt I got to almost end, including credit card info with the 3-digit code, where I was told that the price has changed from 460 to 1600 and whether I would like to proceed at this price. Then I tried to book economy at itravel, at the same 460 rate. Finally I retried at Delta, first le YYZ-DET came out in main cabin, although I was able to change it to preferred at no charge, then 2 legs in Business and final leg in First. The price is great, even for Economy. Thanks for the info Alex! Glad you were able to get it.